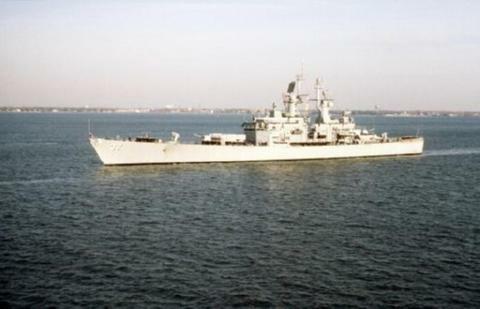 The USS SOUTH CAROLINA (CGN-37), a California class nuclear powered cruiser, was commissioned on 25 JAN 1975. Her early Mediterranean deployments in the late 1970s extended in the Indian Ocean in the 1980s and 90s as needed. SOUTH CAROLINA over her service career was North of the Arctic Circle and south of the Equator, and traveled the North Atlantic, Caribbean, North Sea, Mediterranean, Indian Ocean and Persian Gulf. USS SOUTH CAROLINA served her country for 24 years, 6 months and 5 days, until decommissioned on 30 JUL 1999. SOUTH CAROLINA's sole transit of the Panama Canal took place while moving to the Nuclear Powered Ship and Submarine Recycling Facility at Puget Sound Naval Shipyard where she was disposed of in March 2000. The fifth South Carolina (DLGN-37), a nuclear-powered guided missile frigate, was laid down on 1 December 1970 by Newport News Shipbuilding & Dry Dock Co. at Newport News, Va.; launched on 1 July 1972; sponsored by Mrs. J. Fred Buzhardt; and commissioned on 25 January 1975, Capt. William C. Neel in command. Upon commissioning, South Carolina steamed to Charleston, S.C., to repeat the traditional post-commissioning visit to the state of South Carolina. There she received a silver service for the wardroom symbolic of the close ties between the frigate and her namesake state. Immediately thereafter, South Carolina joined the Atlantic Fleet nuclear task force, operating out of Norfolk, Va, As of May 1975, she remained so employed.